Scale Back Alabama 2019 has concluded. You can still utilize our Health Tips and Resources, and follow us on Facebook, Instagram, Pinterest, Twitter, and YouTube. Mark your calendar for December 2019 to sign up for the 2020 program. For more information about participating in Scale Back Alabama, read our Guidelines For Participation. Scale Back Alabama teams must be made up of two people – no more, and no less! Both team members will be asked to weigh in (and weigh out) together at the same weigh-in site at the same time. If someone on your team is from another part of the state, make sure they can be with your team at those times. Teams must begin and end the contest with the same members – no substitution is allowed. If a team member drops out for any reason, the team will be disqualified from the grand prize drawing. However, individuals who lose at least 10 pounds will be eligible for individual prizes. We are no longer taking registrations for coordinators. 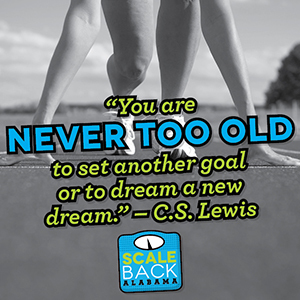 If you’d like to have your organization participate as an official Scale Back Alabama weigh-in site for next year’s challenge, email info@scalebackalabama.com, and we’ll put you on the list and get back with you in the fall. Please note: This program is for organizations and employees within the state of Alabama only.